Today in church, the lesson was on ways that a father can build up his family. There were many great insights into fatherhood that were discussed. One, in particular, got me thinking. It was suggested that a key to raising children was to teach them a good work ethic. I couldn’t have agreed more! Members of the quorum discussed times that they had taken kids to their place of business with them, performed acts of service for the elderly or helped them find odd jobs to earn pocket money. All of these were great, but they got me thinking of what it is we actually want to do with these activities. I think it is to build the Will of the child. It’s not that we need the child to be hard workers to attain things, it’s that they need to have a spiritual fortitude in order to get a job done, especially a job they don’t particularly want to complete, and to escape a sense of being entitled to the outcome without the work required. So, how do we build this fortitude in a young child? The idea of this article came to me a few days ago as I walked in the fields of my in-law’s home in Potter Valley, California. The air was deeply scented with water mint and freshly bailed hay. 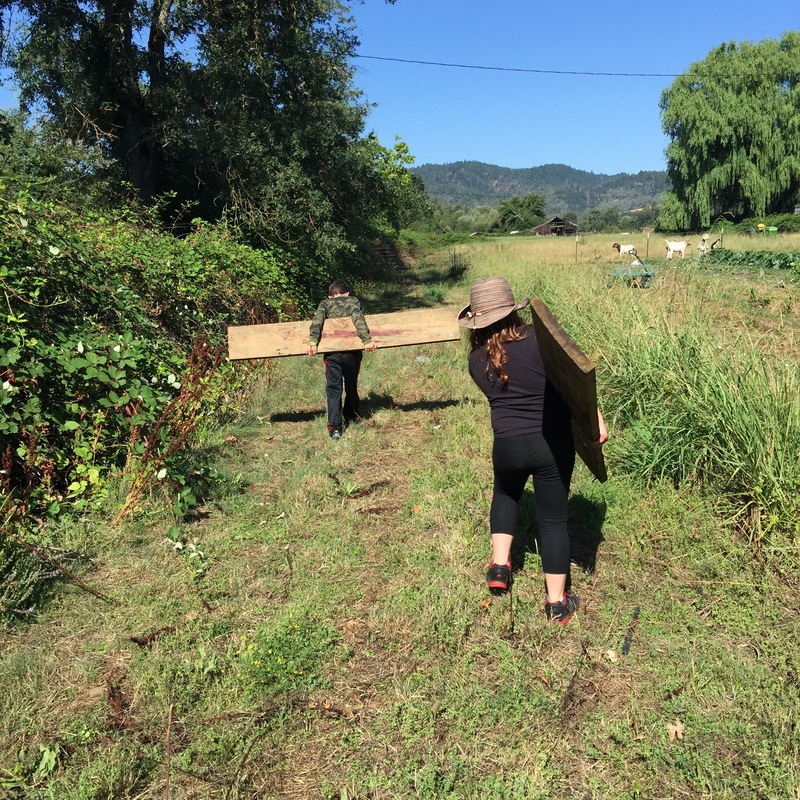 The sun had a tinge of oncoming hotness, but the morning was still cool and welcoming as we carried buckets, a step ladder, and some old fence boards across the field to where the blackberries were ripe and ready to be picked. One by one, the thorns were averted, and the berries were gingerly plucked from the vine until a handful was had. Then, each handful was tossed into the bucket. Slowly, the bottom of the vessel was covered in a layer of delicious black gold. About this time, my 4-year old Wee One looked into the bucket and exclaimed that we were done! Wiping his face with juice-stained fingers he exclaimed “we did hard work!” But, we had been sent on a mission from Grandpa Howard to gather enough berries for the pool party, and to make them into two cobblers. What Wee One didn’t realize was that, although he had eaten his fill, there were many more berries to pick to fulfill his task. What was a few minutes of sheer delight and new adventure became a Will activity, and a glorious one at that. 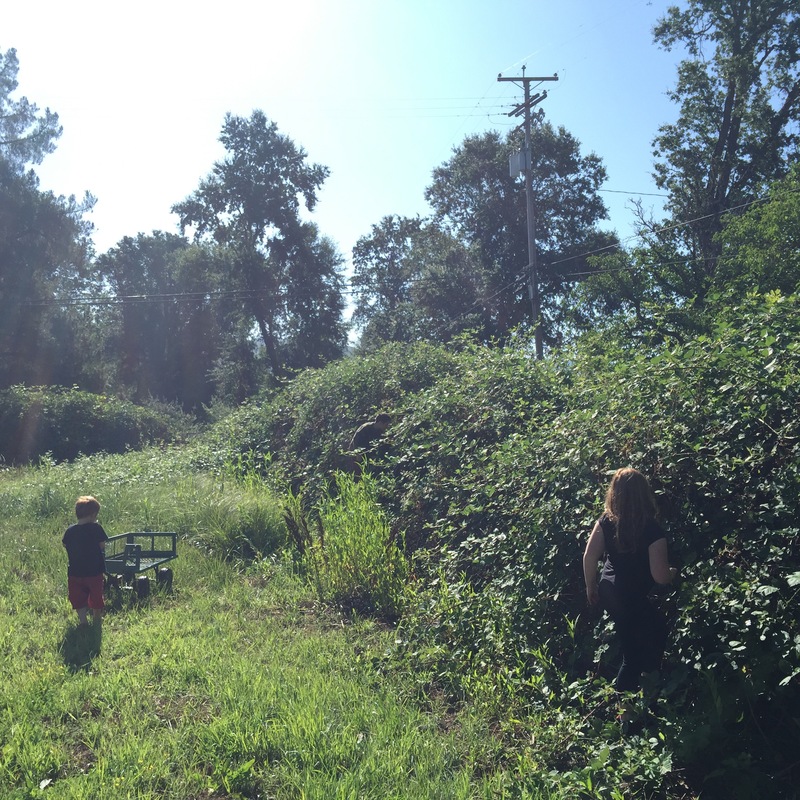 My wife and I discussed the greatness of blackberry picking in training a young child to work. 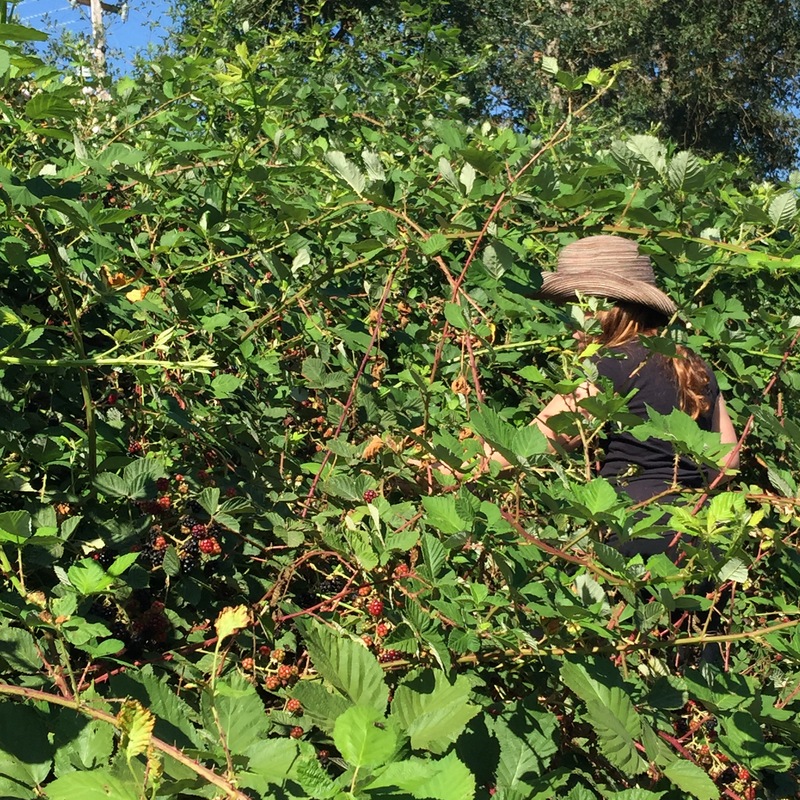 This was a task that required the kids to dodge painful pricks, stand in the sun, work carefully with the squishy fruits, and diligently continue for over an hour as we had to pick about 4 gallons of berries! What more could you ask for in a Will activity than something that requires time, patience, carefulness, just a little pain when you need correcting, and even gives the occasional sweet reward when a berry was just too alluring to make it all the way into the bucket? 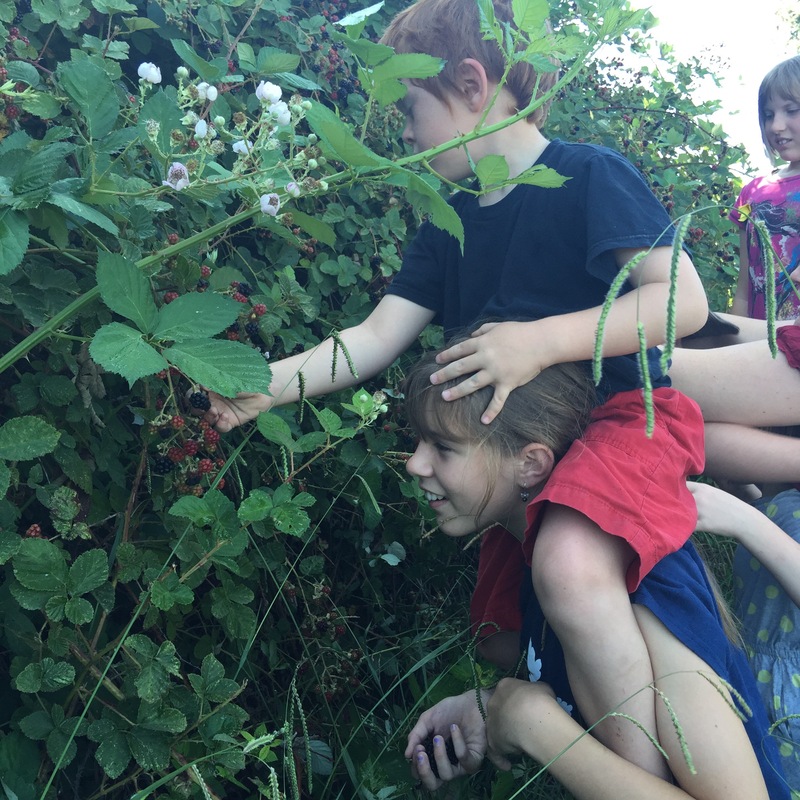 Berry picking will remain one of my favorite jobs for kids. It also was delightful to watch them enjoy the fruits of their labor when the delicious cobblers were placed on the table at the party. So, how do YOU like to build the Will of a child? Previous Yosemite: Turning a class over to the wild embrace of Mother Nature. Thanks for you comment, Michael! I really was impressed upon while picking berries last week, and it segued perfectly into your lesson today. And, you couldn’t be more right! A well-used quote in Waldorf Education (on my wrist as a bracelet as we speak) is “Receive the children in reverence. Educate them in love. Send them forth in freedom.” I think all too often we forget that one of our primary goals as parents (and educators) is to do just that. Send them forth in freedom. All we can do is teach them how to make good choices…we can’t make them choose. Amen Brother! Your students are blessed to have you!